John was the Exploration Group leader at BP Eakring in the late 1970s for 2 years and led the team which drilled the successful wells at Welton, Nettleham and several field extensions in Beckingham. At that time BP had very large acreage holdings in the East Midlands and Cheshire, and he developed a strong interest in Lower Carboniferous prospectivity, specifically in dolomitised carbonate reservoir potential. Wells drilled into the Dinantian at Grove-3 and Egmanton were one outcome of this work and after his leaving BP service in 1980 the Company followed up a recommendation to invest substantially in seismic. In the mid-late 1980s he worked on East Midlands and other UK basin structure style in a series of reports published by Midland Valley Limited, of which he was co-founder, some of these were for licensees and some were non-exclusive. After forming Highland Geology in 1996 he looked at East Midlands intermittently, mainly as an ideas source for Southern Gas Basin exploration, also as a test bed for development of new software for structure modelling. In retrospect we think that disposals of major East Midlands interests in the 1990s arguably followed overly-negative assessment of conventional play potential, with sequence stratigraphy ideas much too heavily influencing exploration review and forward planning. The successor operators subsequently failed to find significant new oil and gas, mainly because they tried to pursue the same plays but for ever-smaller known targets using limited 2D data sets. Of course the fracking potential is the big question now, and there is little reason to suppose that high TOC base Namurian marine shales which are the excellent source rocks for oil in the conventional plays will not prove to be commercial fracking targets. Shale gas and shale oil fracking-based exploration does indeed have the potential to greatly exceed the 80 mmbbl recovered to date from conventional reservoirs. Do we have an analogue of US basins like Ardmore, here? Yes, we think so. East Midlands is very interesting, ready for a new exploration phase. 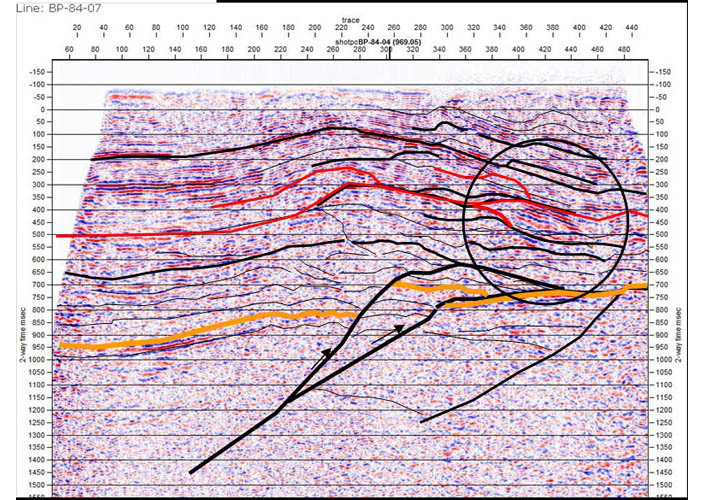 In 2012 John was granted permission to use and reproduce UKOGL seismic, an example of which is shown above, in drafting our creative exploration course. East Midlands is a case history for transpressional strike-slip style, which we consider to be the dominant inversion mechanism in the East Midlands Variscan deformation. This conclusion lends more insight to the mapping of the carbonate platform margins and the important inverting faults which cross the platforms, and locate the known fields. It is important to map the platform margin fault systems on regional scale, rather than being data driven and adopt a keyhole approach. The whole basin group, we think, warrants an innovative renewed search for both conventional and unconventional oil and gas. 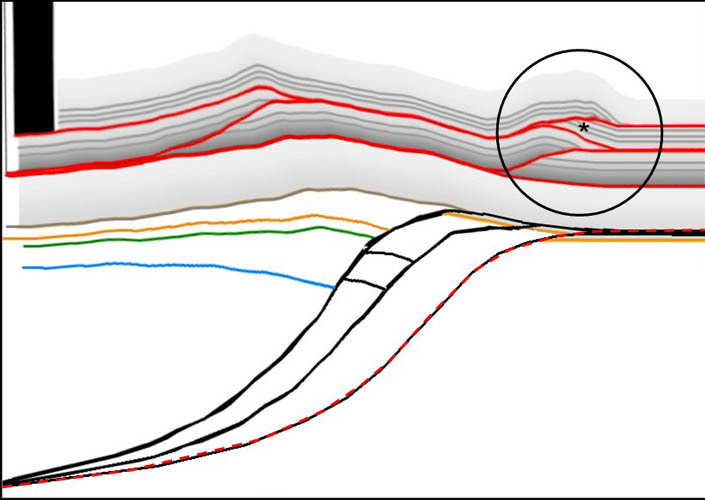 Recognising oblique compressional inversion in this particular example, which is the Calow-Mansfield fault system picked with inverting faults drawn in red, leads us to identify local anticlines on the platform margin as pop-ups, with reverse faults on both margins. This is consistent with clear instances of reverse faulting seen in Dinantian along strike at the Calow and Mansfield domes, and with structure style seen in the Upper Carboniferous. It is interesting to look at analogue structures in other thrust-fold belts, and we do this in the course. One such area is the El Torcal pop-up near Antequera, in the Betic Cordillera, Malaga Province, which we visited recently. It also has Jurassic dolomitised karst terrain which makes an interesting comparison with the top Dinantian of East Midlands. Conventional play potential in East Midlands can be modelled using the Depthcon software, which is a section balance program written by John Nicholson, its included in our “Creative Exploration” PDF set. Forward modelling here has built an interpretation which guides picking the complex seismic of Mansfield Anticline. Now we’ve got an explanation for the bright zone in the Namurian forelimb, this could be gas trapped updip by a refolded ramp fault. Where is the Dinantian top (orange marker) in the hangingwall at around 1 second, is an issue remaining unanswered: but the question can be addressed proactively using models like this.